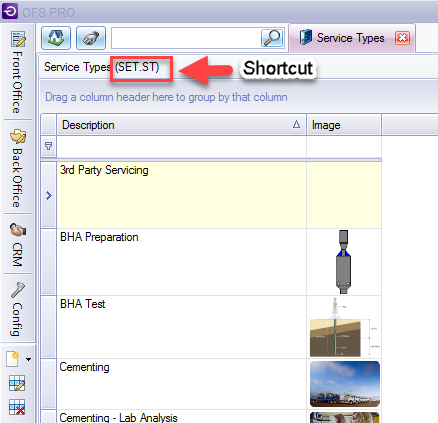 The Toolbar is oriented toward the lower-left corner of the application (below Configuration). The bar is actually comprised of three separated modular sections. 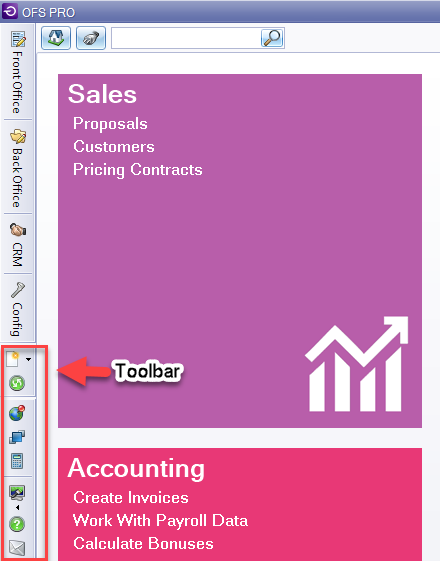 The icons on the toolbar are shortcuts to frequently-used menu commands. You can hover the cursor over each button to view a tooltip describing the button’s function. New – Creates a new entity depending on which application window/grid is active. Click the arrow next to the icon to select an item to create (the options are Work Order, Employee, Customer, Customer Contact and Asset). When clicked, it creates a new entity depending on which window and active grid it is on (e.g., new system user, new document, etc.). Edit – Opens the detail window for the active (selected) record in the grid. Duplicate – Duplicates the current row. It opens a window for a new item, but pre-fills fields with the chosen record’s details, to create a duplicate of the current item. You can edit these details and save the changes into a new record. Print Grid–Sends the active grid to the printer. Refresh – Refreshes cached data from the database as well as the current screen. Show Map – Shows the geographical map. Reset Layout – Resets all customizations made for windows and the grid layout. Open Calculator – Opens the calculator (standard Windows application). Style – Changes the appearance of the program. About– Shows questions and answers about the OFS Pro program. Send Report – Sends a report to OFS Support requesting a new feature or reporting an error. Switch out the look and feel of OFS Pro with one click through our variety of options for interface skins. Styles changes the colors, fonts, and even some of the small icons related to each window’s components to represent your preferred personal design. Choose an “Office 2013” color scheme for a traditional look, or the soft easy-on-the-eyes pastels of “Lilian.”. Styles like “High Contrast” and “Whiteprint” provide a high-contrast look which may be more comfortable to certain users. estive skins like “Pumpkin” and “Valentine” lend a bit of seasonal or holiday joy for any time of the year. You can search within the documents uploaded to either the Documents module (Back Office->Documents), or to Notes of resources with Notes tabs (Business Units, Assets, Job Types, etc). Type anything into the Search box that will match to either the file name or the title of the document, press Enter to see a list of results and double-click any result to open the document window.